If you think a loaf of banana bread packs too many calories, think again! This sweet bread mixes two of our favorite fruits — strawberries and bananas — into one delicious recipe that’s a little more nutritious than the classic, but still just as tasty. It’s perfect at breakfast or brunch, or as an after-school snack with the kids. The Greek yogurt makes this bread super moist while adding a bit of protein as well, which is always a bonus. 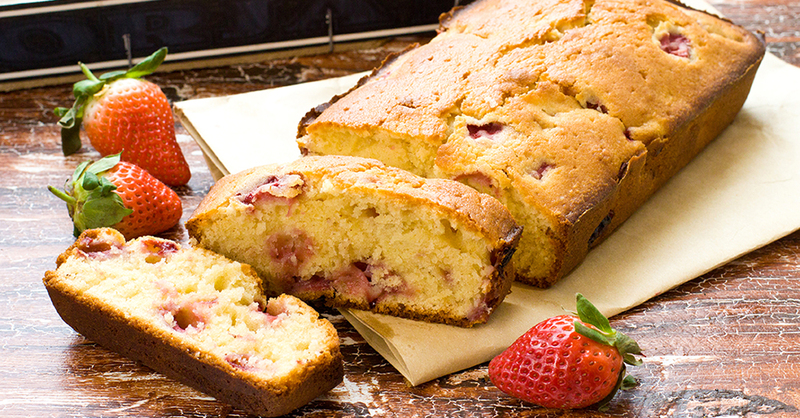 We use fresh strawberries and ripe bananas for a sweeter bread without a lot of sugar. In about an hour our kitchen smells like heaven, and we have a tasty snack the whole family loves! Preheat oven to 350 degrees Fahrenheit. Grease the bottom only of a 9-by-5-inch loaf pan. Mix together flour, baking powder, baking soda and salt in large bowl. Set this mixture aside. In another large bowl, combine brown sugar, bananas, strawberries, eggs, vanilla extract and yogurt. Mix well with an electric mixer. Pour the dry ingredients slowly into the wet ingredients, and mix until blended well. Bake in oven about 45-50 minutes or until golden brown. Insert toothpick or knife into center; if it comes out clean, bread is done.